Dango were brought to Japan from China originally as a food offering for the gods, but in the Edo Period dango skewered on a stick became a popular treat among the common people. 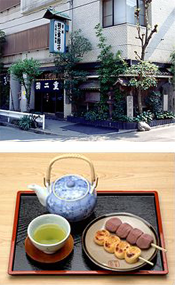 Tea houses sprang up along the main thoroughfares where people could stop and rest on their journey, and dango were the perfect light snack. So loved were they that they appear in the proverb, -Dango, not flowers!î which means that seeing to one’s belly comes before the appreciation of beauty. Dango are made from rice flour, wetted and pounded into a semi-glutinous state and shaped into little balls. We offer dango in two styles: Spread with a coating of sweet bean paste called “an”, or dipped in soy sauce and toasted. Visit our store and try both styles while enjoying our lovely traditional garden created by our founder who started out as a gardener. Take some home with you as well. Remember: Dango should be eaten on the day of purchase.